According to a new market report published by Transparency Market Research titled Industrial Gas Regulator Market - Global Industry Analysis, Size, Share, Growth, Trends, and Forecast, 2018–2026, the global industrial gas regulator market is expected to reach a value of US$ 18.96 Bn by 2026. In terms of value, the market is estimated to expand at a CAGR of 3.4% during the forecast period from 2018 to 2026. Rising demand for natural gas for power generation and operation of industrial units in various industries is projected to offer lucrative opportunities to the industrial gas regulators market. Governments of different countries globally are promoting the use of natural gas instead of conventional fossil fuel for the generation of power to reduce carbon emissions. Furthermore, growing demand for technologically advanced gas regulators is anticipated to build a new standard of products with high degree of operational ability, safety, and efficiency. Stringent government safety regulations and guidelines across the globe for the manufacturing and processing sector is expected to be the major factor responsible for the increasing demand for industrial gas regulators globally. Furthermore, the utilization of various gases during R&D and processing requires specific gas regulators to prevent dangerous accidents, which have led to the enhanced demand for industrial gas regulators in the market. The pressure reducing industrial gas regulator is expected to grow steadily due to its applications across all end-use industries. Based on gas type, inert gas is expected to witness growth at a CAGR of 3.1% over the forecast period because of its increasing demand from pharmaceutical, oil & gas, and chemical industry. In a bid to follow good manufacturing and safety operation practices, industrial gas regulators are expected to drive the market based on gas type segment. Based on regulator type, single stage regulator segment is expected to dominate the market in terms of revenue and expand at a CAGR of 3.6% during the forecast period. The growth is attributed to its ability of low energy consumption and availability at cheaper prices. These regulators are best suited for all applications with minimal inlet pressure variation. Oil & gas application segment in the industrial gas regulator market is expected to witness steady growth of 3.3% over the forecast period. Rise in demand for operating and monitoring of manufacturing units has led to the growth in the manufacturing sector which is further projected to enhance the business of industrial gas regulators. Furthermore, advanced industrial gas regulators are expected to dominate the market due to their high reliability and safety advantages. Pipeline service providers and operators are planning to enter strategic collaborations for the further development of industrial gas regulator technology. Additionally, rising demand for gas powered power stations and automobiles are also projected to provide growth opportunities to the industrial gas regulator market. These gas regulators are majorly utilized as pressure indicators of the tanks in various industries. 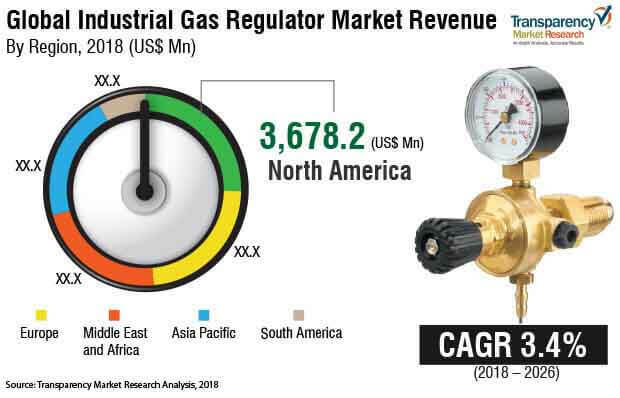 The industrial gas regulator market in Asia Pacific is expected to witness the highest growth over the forecast period owing to the growing awareness amongst end-users and rising demand for industrial gas regulator products in the region. The market in the region is expected to witness growth at a CAGR of 4.1% during the forecast period. Factors such as increasing demand for industrial gases, specifically in chemicals, energy, oil & gas, medical care, and various other sectors are projected to spur the market growth. China is anticipated to be the dominant country in the Asia Pacific industrial gas regulator market during the forecast period. Rapidly increasing metal production and manufacturing industries in the country along with the growing electronics market are considered to be the factors behind the market growth. Additionally, industries such as printing, textile, paper & pulp, and polymer consumes high quantity of chemicals which further offer growth opportunities for the supply of industrial gas regulators. Some of the major players in the global industrial gas regulator market are Emerson Electric Co., The Linde Group, Air Liquide S.A., Praxair Technology, Inc., Air Products and Chemicals Inc., GCE Holding AB, Cavagna Group S.p.A, Honeywell Process Solutions (HPS), Itron Inc., Rotarex, and PietroFiorentiniS.p.a. The industrial gas regulator market is segmented as below.